So, as you guys know, we are home now. The drum currently resides right on top of our Family Altar. It now also has a White Swan feather…….. 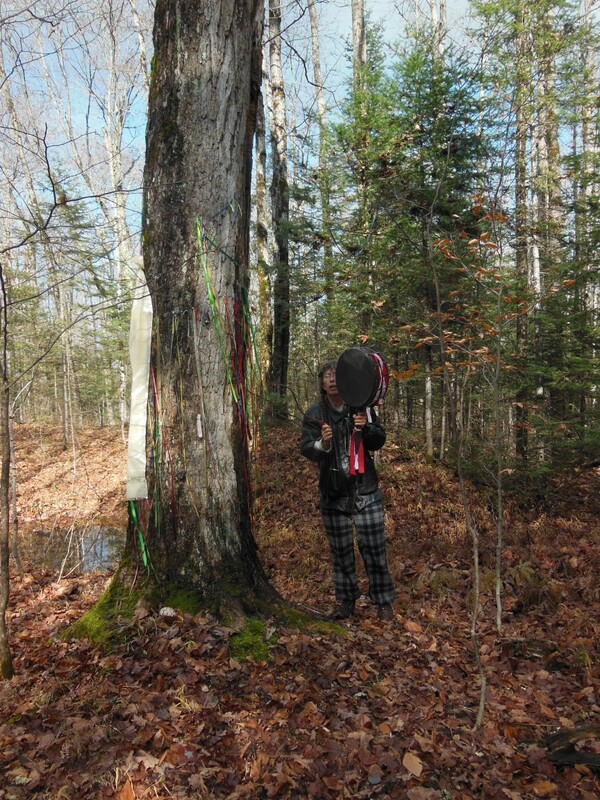 The day after getting home we went to our Tree of Life and I took the drum along, to show it, where it lives now. Of course I played it and chanted…. Do not be fooled by the nice sunshine on the picture: it is – 4 centigrade. 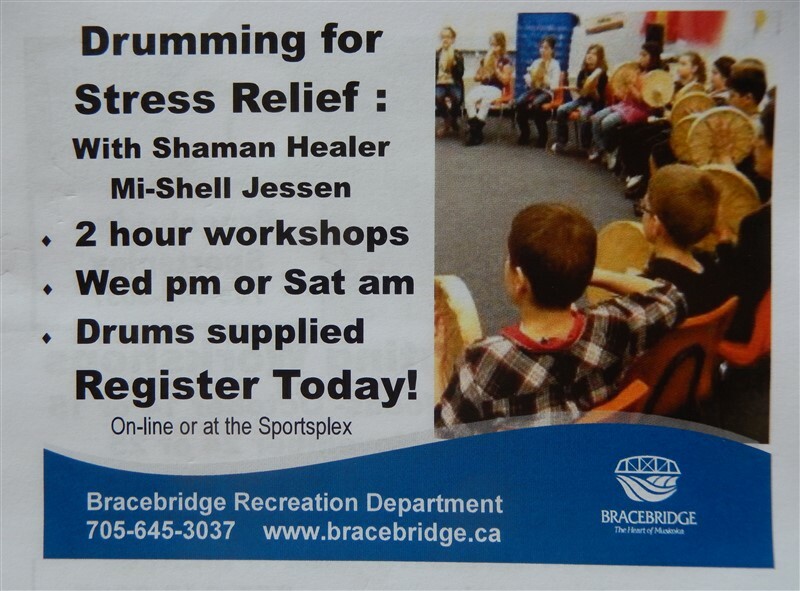 I must say, I find it fascinating that a shaman, while in trance still can wield so much control over the rhythms he/she drums….. They do not keep me on a strict drumming schedule, although I know, certain “dealings” or “treatments”call for, go with certain rhythms and chants and that may be similar from patient to patient, but never a set formula. 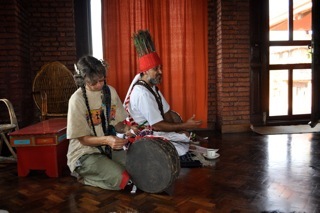 Do the teachings of these rhythms “come through the drum into me, because, this is, how Nepali shamans do it? But I am not Nepali and the Gods and Spirits i am bound to are quite different…. what will happen?? Well…. I tell you , what happened…. As long as I was in OC = ordinary consciousness, no problem drumming the way Bhola taught. Then quickly however the trance comes and to maintain it I drummed about 180 to 200 beats a minute,. My question was, “How should I handle this drum and use these teachings.?? Crazzzzzzzy but true, I found myself in the courtyard of Swayambhunath! Talking to the very Monkey, that is seen on our pictures sitting on the large bronze Varya. Bhola’s head appeared on the shimmering light behind the Monkey. 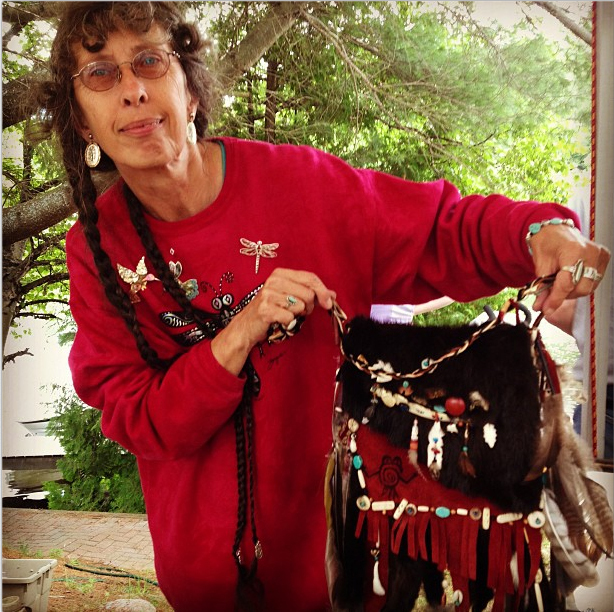 “Some people perform (being a shaman) some people drum (like a shaman) some people are …????? (a word that I did not understand, but it’s meaning was evident) and they fall of the (viewpoint over Kathmandu ) and fly away……. Eventually I ended up safe and sound on my own Reindeer fur at home…… Yes, and as soon as I was “sort of back there” I tried to remember, what to drum now and how to hold the drum and what not…. My brain was EMPTY!!! THAT however is a typical sign for a full Theta trance… At least for me…..
Should I now go practice these specific rhythms and see where that leads? It would be interesting…. Or – should I just “fly”?? 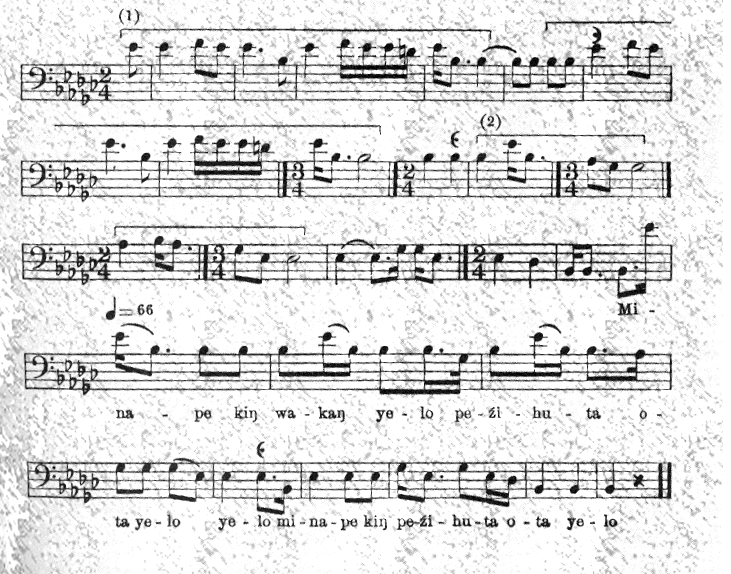 Will you now go and “test-drive” these rhythms – and tell us here, what you experienced??????? And Yes, Bhola, if you ever read this, can you say, comment on this, add another piece to the puzzle? Nepali double sided shaman’s drums. There were several, but not for long….. 2 smaller ones were taken immediately. I held out my left all feeling hand and – there was one that had A LOT of Power. No, Bhola said, that is my spare drum…. Each drum came with a beater, bend in a snake-like shape and was adorned with a red cotton thread – for life. 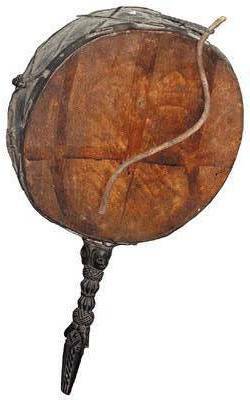 Nepalese shaman’s drums (dhyangro) are double headed, and covered by animal hide the drums are made of special wood. 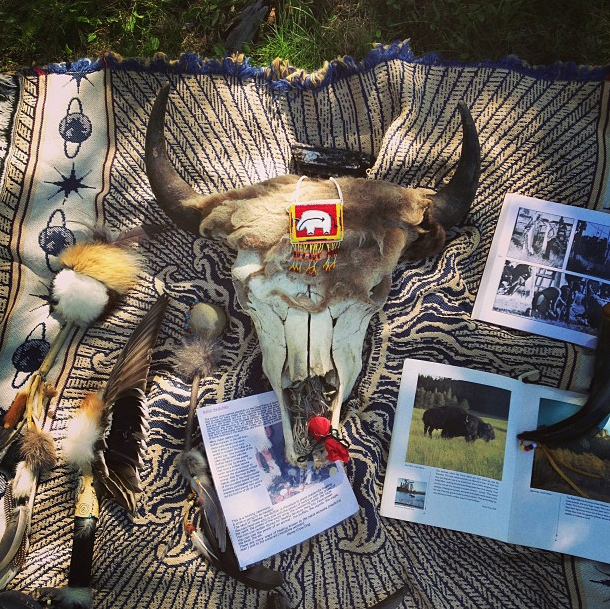 The animal hide used nowadays is either mountain goat, deer or a domesticated goat or sheep. They also have a handle in the shape of a ritual dagger (often known in the West by it’s Tibetan name phurba) which has three sides to its blade, which in its three dimensional way represents all the cosmos. On one side of this triangular bladed handle there is the beak of the regal Eagle, or perhaps an Owl or a Horse or a Thunderbolt or an Elephant. 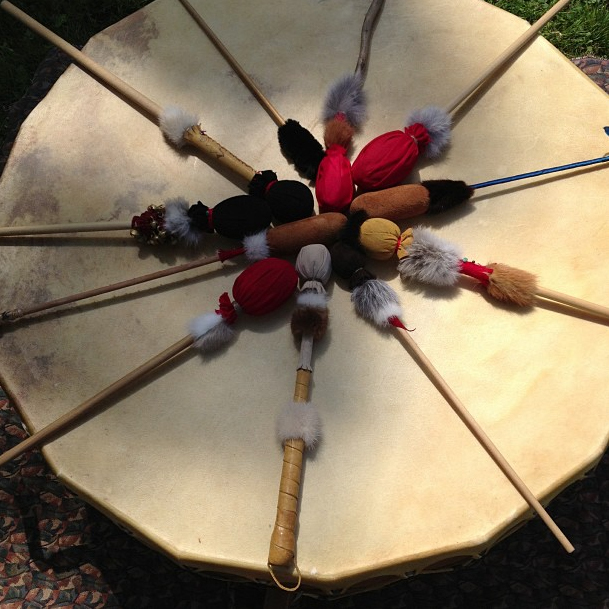 This is the male side of the drum, so when we hold the drum in front of our face, this male side should be facing outside. 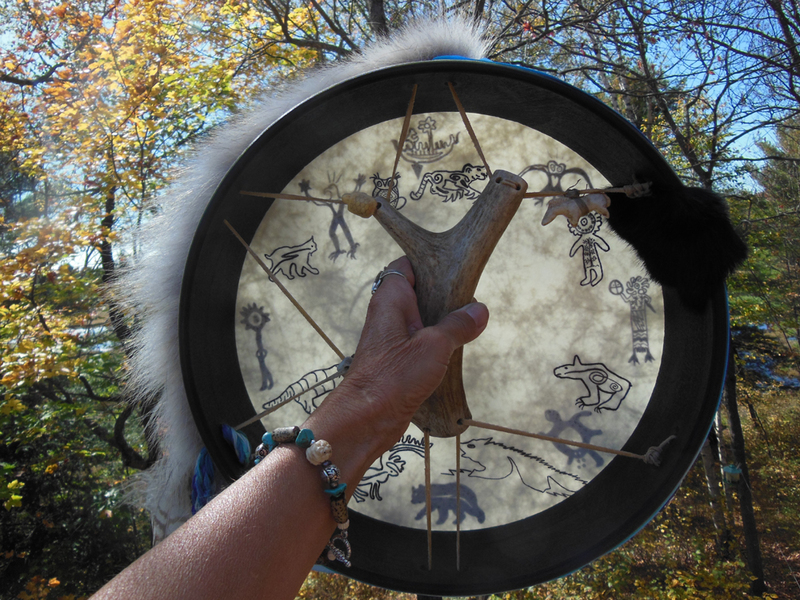 The spirits hardly make any difference between a male and a female shaman, as the drum is the universal instrument used by both the sexes it makes no difference. 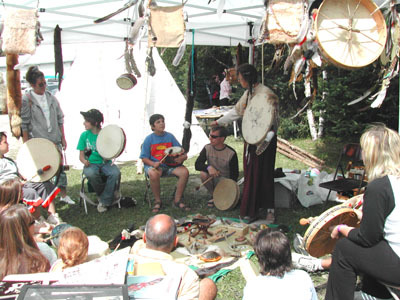 Some shamans respect the male and female sides of the drum, but some shamans don’t, it depends upon the instructions they have received from their teachers and the spirits. 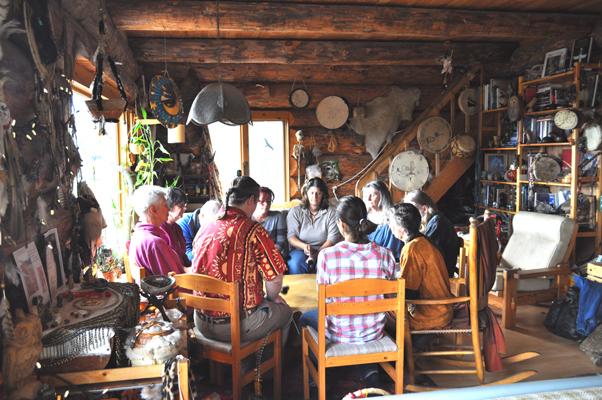 If the shaman works with the male and female sides of the drum differently, the male side is used in the beginning of a shaman’s ceremony to call in the spirits. The female side is used towards the end of the ceremony or ritual to send away the helping spirits. 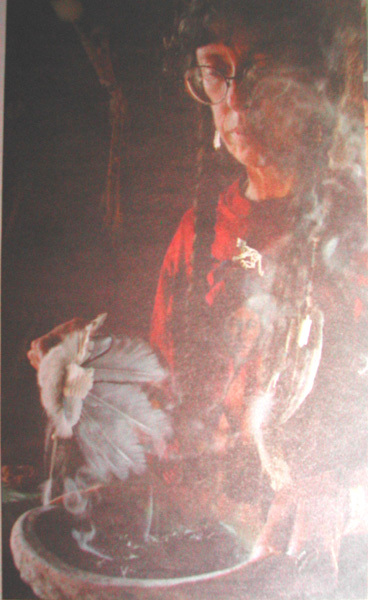 The shaman starts to drum with a 1/4 beat [O O O O O O], during which they will observe their whole body to look for tensions, performing deep breathing in order to relax, They will then invite their spirits and ancestors in to help them, and make their intentions for the ceremony or healing clear. 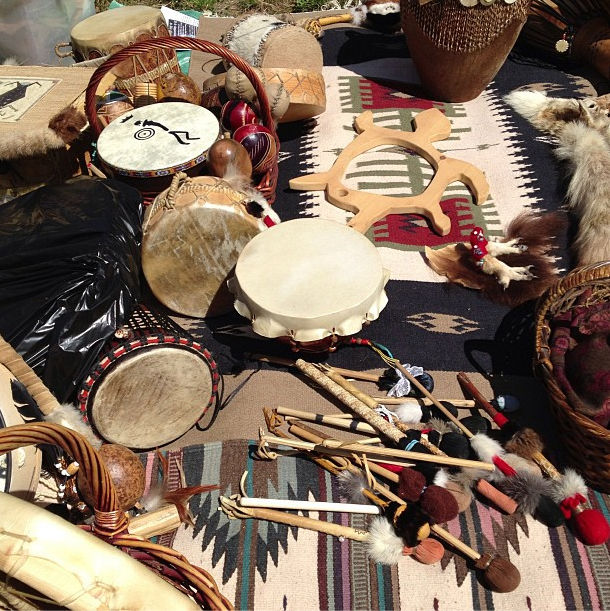 Suddenly the shaman’s drumming will change rhythm to a 4/4 beat [O o o o O o o o O o o o], during which the shaman starts feeling sensations of heat and cold in their body as the spirits come closer and start inspiring them. When the body of the shaman starts to move and shake, or they start to dance, the rhythm of the drumming becomes very random. Towards the end of the session the female side of the drum is used, and then the rhythm becomes a 3/4 beat [O o o O o o O o o]. During this time the shaman starts calming and slowing down, and eventually the beat changes to a 2/4 [O o O o O o O o] and eventually a 1/4 [O O O O O O O] before it comes to a stop. As a welcome gift I presented my drum with a Peacock feather. This is however only the first part of what happened. Now, I can do just that with quite a few of my own drums, have – at times, when no drum was available, also used a plastic waste paper basket ….But I also have encountered – and own quite a few drums, where that is not possible. Some drums just do not “resonate right” and, as you can imagine, all double-sided drums are among this group. Now, Nepali drums are double -sided! So, not so good for diagnosing… for me that is…. Well, I can use the Rattle for diagnosing…. I wrote in the previous post about the humidity and – the sheer trouble of stuffing a drum into a piece of luggage along with wet wipes, water purifying solution, electric adaptors, diarrhoea and dehydration medicines and whatever else was on the list of things to bring…..
We decided on something cheap, that is made from man made materials, will take any kind of abuse and not bend out of shape or break / split its head. The contraption was $ 55.00 … and yeah!? ….Not impressive…. It sounded – well – not like we are used to. All my working drums are quite large and have a low resonant tone. 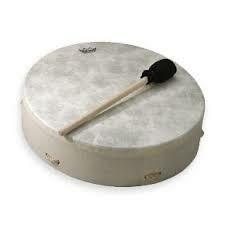 This drum has not much resonance compared to them. So we put it aside and Peter, who first wanted to paint it and make it his – eventually just frowned and …. it collected dust…. 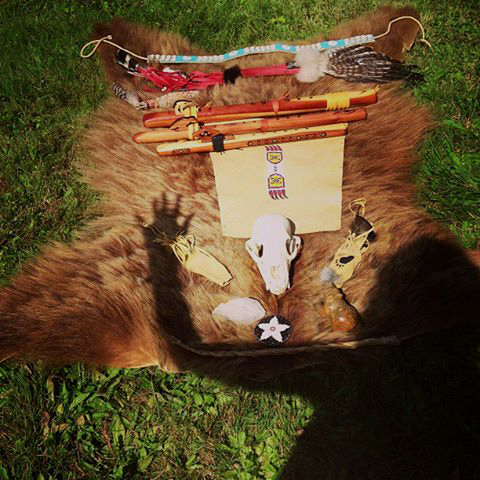 So I went on a shamanic journey and asked for instructions. The very first thing I was told was, that it needed a Deer Antler handle in the shape of a trine! And it was supposed to receive sky blue silk for the Tengeri of Siberia!. 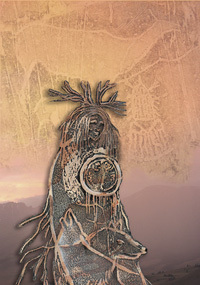 Another journey revealed, that I was to paint it with petroglyph and pictograph designs – just like my main Ritual Drum, so the Spirits of the Land, that is always work with, are there as well. Then, into the inside I was to draw my Ancestor Spirits and representations of a few of my Animal Guides, the Tuvan Sun Spirits I always “see” and my Clan Guardian from my Ada’s clan. It also was to receive “Sky Snakes” in the form of silk threads/ribbons of all different shades of blue into which I am to tie beads, one new bead for each experience I will make on this trip and then, later on while using this drum…..
With time in short supply I went to work. 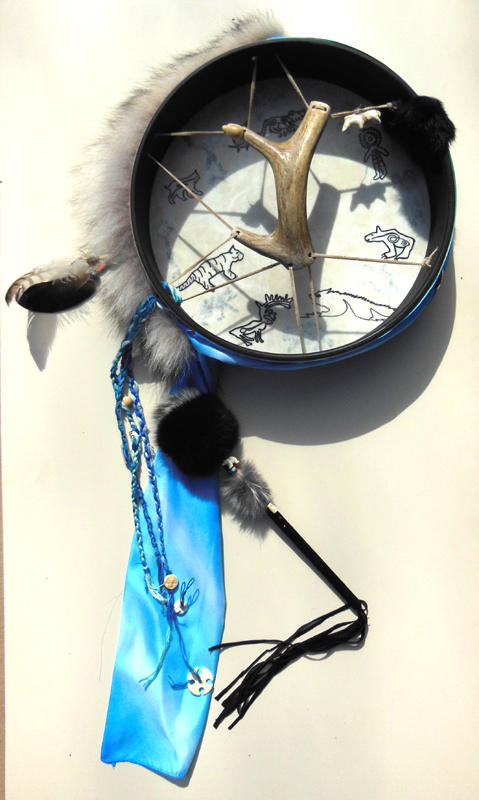 The drum has a lot of Wolf fur in which a small Serpentine Bear with Turquoise eyes is hidden, a large Owl that was a gift from a friend, the slightly sour and disconcerting face of Ee’ren Omsür in Abalone shell and the requested Sky blue silk Spirits that, on the one hand represent a waterfall I saw during the first journey. All the silk Snakes,that I was told, have significance for the Spirits of Place in the Himalayas, looked a little too untidy and crazzzzy, so I braided them into 3 braids. For now I wove several beads into that braid. One for the incredible invitation to even GO on this trip, one for the visions received as to how to proceed with this drum, one for all the things I have since learned about Nepal, its people and the way they worship as well as the way in which all the world religions there weave into each other……. The BIG surprise however came, when I held the drum up into the light and realized, that all the Medicine Drawings are shimmering through the drum head and the ones drawn into the back side appear like Spirits on the front side and vice versa! 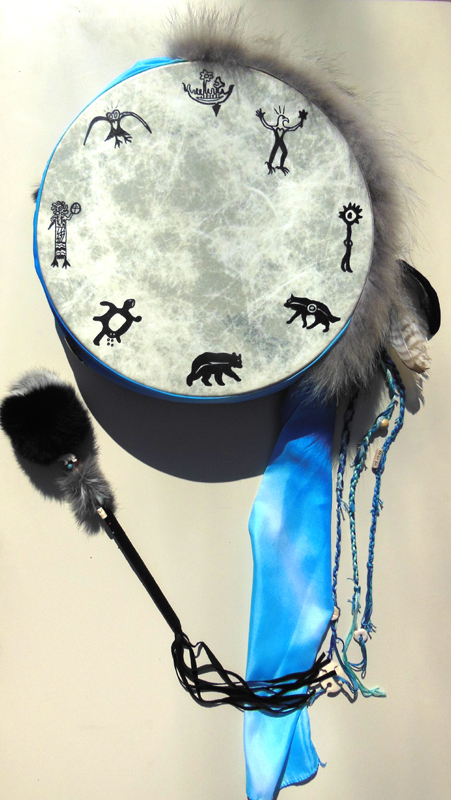 This drum sounds best with a very soft beater and so I made one with Rabbit fur, to feed Wolf and Owl and added a little bone Bear…. 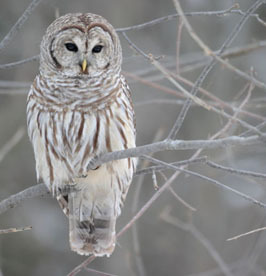 For now there are just 2 small feathers…. I will have to find feathers for it during the trip! I will spend every minute we are in Chitwan National Park looooooking!